The moment of embrace between lovers is perhaps the most intoxicating and mysterious force within the realm of human experience. Two individuals encircle and envelop one another dissolving their apparent separateness. In the physical embrace of love, our consciousness expands and we glimpse the enormity of the cosmic and earthly forces that we are made and shaped by. 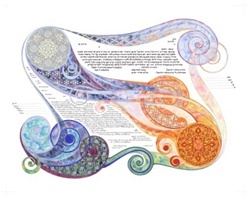 The focus of Amy Fagin's art work has used the framework of manuscript illumination to explore contemporary themes of visual art within the context of world and Jewish history. Her commission work combines the beautiful historic traditions of Hebrew Calligraphy with the current issues of our era. Illuminated manuscripts created for ceremonial occasions are inspired by the unique nature of the individuals and the occasion to be commemorated.